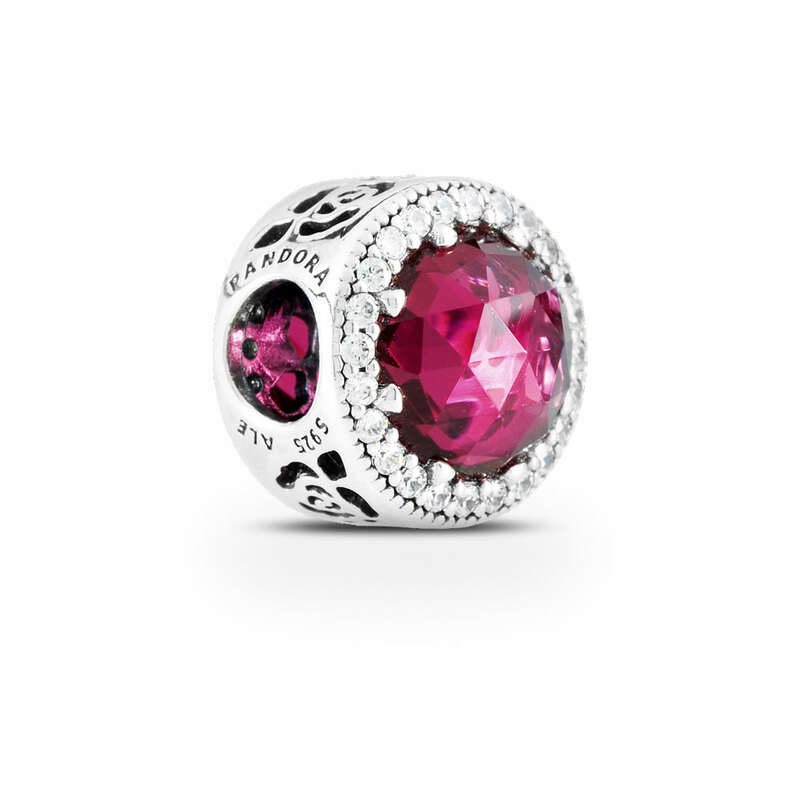 This pretty button charm is inspired by the magical rose from Beauty and the Beast. Beneath the striking cerise stones, a cut-out rose pattern is revealed in a beautiful tribute to the story's message that true love is found within. Available online or in-store.This item is a single charm only. Bracelets sold seperately. Styling images may show this charm on a bracelet as styling inspiration. Disney Belle's Radiant Rose Charm is rated 4.8 out of 5 by 17. Rated 5 out of 5 by lilbear from Love, Love, Love My boyfriend got me this charm for Christmas and I absolutely love it so much. Almost got me in tears. Beauty and the Beast is my favorite Disney movie because of the message behind the movie and the charm says it all. Rated 4 out of 5 by JHK81 from Love the details This is very pretty,I love the rose details. I was a bit thrown when I received it only because I expected the round jewels to be more flat. It's hard to know just looking at the stock photo. But it's still pretty! Hope this picture attached gives you a better idea. Rated 5 out of 5 by MamaCoop from Beautiful charm Bought this for my niece for her upcoming graduation. Such a pretty charm. I’m confident she’ll love adding this piece to her collection. I may have to get me one too. Very pretty. Rated 4 out of 5 by VanessaV from Beauty This is a beautiful charm. I only wish it wasn't so purple pinkish and more of a red tone to go along with the rose. Rated 5 out of 5 by Lkyram13 from Tale as old as time, in a charm! My husband added this beauty to my collection. I'm glad he did!! The color is not overwhelming, you are able to see the rose within the charm. Rated 5 out of 5 by AIDA from Gorgeous! Saw this charm in an advertising and immediately fell in love! While the rose is not as easy to spot as the pictures would lead you to believe it is absolutely beautiful. I love it. Rated 5 out of 5 by Cindreamer from Pretty Nice Charm I finally bought this Charm about a week ago. Now when I see my sisters charm I no longer have the temptation! It truly looks beautiful and very comfortable to wear doesn’t get caught on my clothes or digs into my wrist. Only thing is I wish it was more on the red side than a cherry color but Still looks great! Rated 5 out of 5 by YourNameHere from Beautiful rose! The way the Rose shines through the gemstone is absolutely stunning. It’s a little overpriced but a gorgeous addition to any bracelet!